Help us Save Chomonix Golf Course in Lino Lakes! We must act fast or we could lose another local course! They are proposing repurposing it for multi-purpose recreation that may likely cost the county (and tax payers) MORE than the annual losses it has seen operating as a golf course AND eliminate the ability for generations of Anoka county and surrounding area golfers the ability to play this wonderful course. With over $800,000 in annual INCOME and 25,000 annual rounds, this property should be profitable as a golf course operations and we have a marketing and management team available that can make Chomonix profitable again. Please fill out the below petition to SAVE CHOMONIX to let Jeff Perry the Park and Recs Director know that residents and Twin Cities area golfers want to keep the course open AND see it profitable for the county. 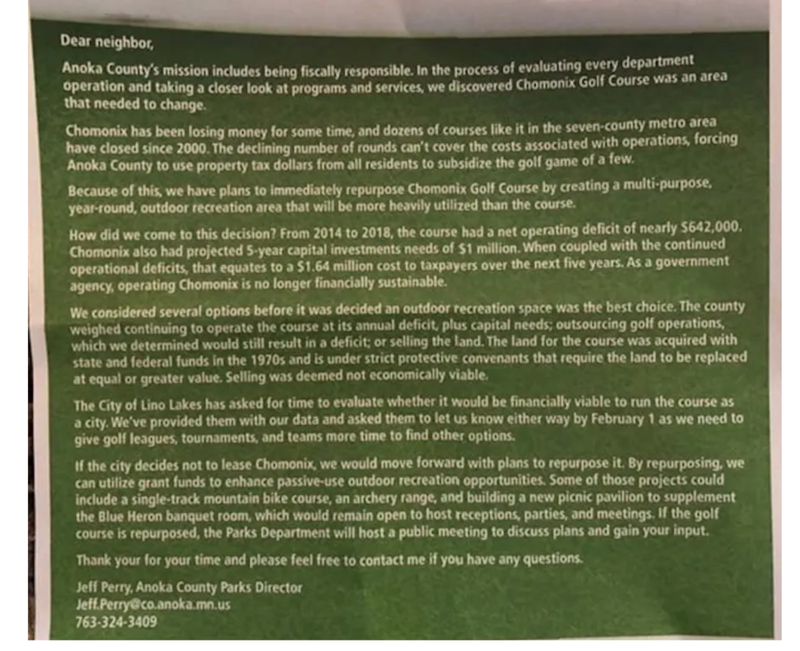 Due to many of you quickly responding Monday on social media to our "Save Chomonix" petition, Anoka County has is proposing to continue course operations for a minimum of another 3 years (see below) but we still need your help and support to make this a reality and success. TCG has been asked to meet with them to give ideas on how to improve marketing and profitability so we still need your help to show them our support. If you would like to see the course succeed (and to see the extension update), please sign our online petition (takes 10 seconds) above. We will be sharing at the county board meeting on Feb 5 the results of our petition and keep everyone who signs updated on the progress.